Everything started in March 2017 when I accepted an assignment as a Civil Affairs Officer with the United Nations Mission in the Republic of South Sudan (UNMISS). News and reports on the dynamics of the conflict in this country heralded my deployment—a number of my friends tried to discourage me from going. Despite their concerns, I was determined to accept the assignment due to the possibility of engaging with communities at the grassroots-level. Serving as a UN Volunteer with UNMISS, I knew, was going to contribute to peace efforts in South Sudan. 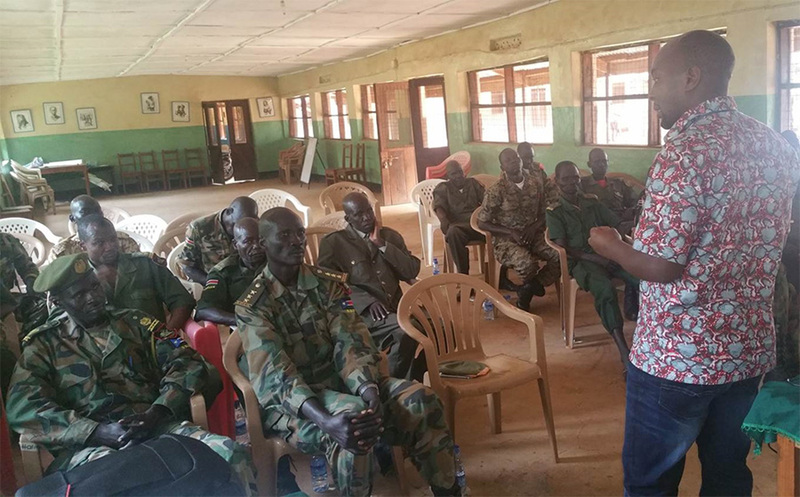 My experience serving with UNMISS in the context of intercommunal armed conflict in South Sudan is for me unmatched. The Civil Affairs Section plays a pivotal role as it contributes to the implementation of the mission’s mandate in the context of intercommuncal and armed conflicts, working mainly in conflict management, support to social cohesion, reconcilation efforts among conflict parties and early warning capabilities. I am proud to have contributed throughout my six month assignment as a UN Volunteer to the activities of the Civil Affairs Division, participating in information-gathering, providing timely reports on conflict management, protection of civilians and peace process activities. My role required that I map key actors and stakeholders and maintain contacts with local government authorities, political, traditional and religious leaders as well as civil society groups, briefing them on the mission’s mandate and activities in my area of assignment. UN Volunteers make up about half of the civil affairs personnel in UNMISS. They play an invaluable role in ensuring day-to-day operations. It is an honour to have served as a UN Volunteer with them and to know that, most importantly, local communities in the field were happy with the work we did. In May 2017, I was involved in organizing a peace forum in Rimenze, a remote area 35 kilometers from Yambio, in Western Equatoria. In this area, over 6,600 internally-displaced persons (IDPs) were registered and sheltering in a Catholic Church compound during more than four months without any humanitarian assistance. Circumstances in the field can be incredibly difficult at times. These IDPs, mostly women and children, were traumatized by the effects of the violence that resulted in the killing, looting and beating of civilians. This breached the trust and confidence between parties. These communities remained concerned for their safety and protection, losing hope after having experienced all sorts of abuse. This peace forum aimed at providing a platform for community, religious, political and traditional leaders, along with the UNMISS team, to spread a message of peace and engage with the IDP community, advocating the need for forgiveness and peaceful coexistence. My role was to identify and mobilize key actors and stakeholders, including both state and non-state actors. This was crucial to the success of the forum. In the end, I was happy with the positive feedback received from the local population, especially from some church leaders, regarding their sense of the chances for peaceful coexistence in the area. Today, I am glad because I know I have brought hope to these vulnerable groups while improving the confidence in peace efforts deployed by UNMISS. My experience as a UN Volunteer has allowed me to contribute directly to the mandate of the UN Mission in South Sudan. This experience has radically changed my views and opened me to new perspectives. I am delighted to have been part of an incredibily committed team that works hard to bring peace in this challenging environment. I have seen how, as long as the work is done alongside local communities, people will help each other and contribute to peace.